Al and I watched this movie together. I’m pretty sure we didn’t see it in theaters, since I was still away at college when it was released. I love Emma Stone, especially in this movie! If you’re looking for a good laugh, with a modern twist on The Scarlet Letter, this is a great choice. Also, Emma Stone and Penn Badgely are adorable. Thank you for being with me on this wild ride of Romantic Movies posts! 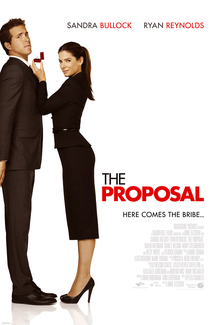 This is easily one of my top five favorite romantic comedies. I’ve been a fan of Sandra Bullock for what seems like forever. And Ryan Reynolds has built himself one heck of a career as well. This film was also somewhat unique, if not slightly controversial with the immigration angle. However, I love how refreshing this story line is, and how great they are on screen. If you haven’t seen it, I won’t spoil it. But, if you’re looking for a great story with some awesome laughs, this is the movie I would recommend every time. While not technically a romantic movie, this was my first introduction to Indian movies and culture. 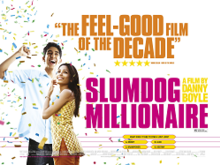 I enjoyed the blossoming relationship between Jamal (Dev Patel) and Latika (Frieda Pinto). I also love how this movie is based on a true story. If you haven’t seen it, I highly recommend it. I loved seeing it in theaters. The soundtrack is really cool, too. I remember gushing over this movie when it was first advertised. I had the opportunity to travel to Potomac Mills for Christmas shopping right before final exams in December 2007, which was the end of my first semester of college. A bunch of us saw this movie in the mall’s movie theater. I thought it was great! The cast is awesome, especially Amy Adams and Patrick Dempsey. And the music was excellent. The soundtrack is one of my favorites. It may be a bit cheesy now, but I love how light-hearted and fun this movie is. I also appreciate how many homages and parodies of Disney movies and characters are wrapped up in this sweet package. If you haven’t seen this movie, and need a good laugh, I highly recommend it! I’ve loved Amanda Bynes since the beginning of her career. Inspired by Shakespeare’s Twelfth Night, this is a fun romantic comedy coupled with sports. And Channing Tatum – Yes, please! 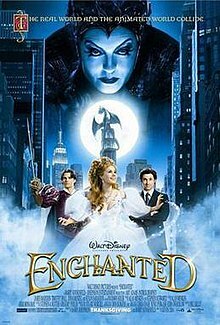 My mom and I went to see this movie when it was in theaters. 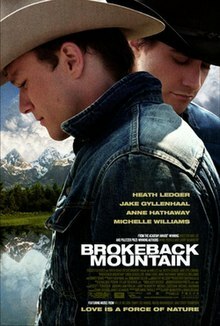 Based on the 1997 short story by Annie Proulx, this is such an interesting and dramatic movie! I loved Heath Ledger and Jake Gyllenhaal already, but seeing them navigate their complicated relationship between 1963 and 1983 was powerful, and also gut-wrenching. I also enjoyed the performances of Anne Hathaway and Michelle Williams. For the first time, in 2005, I realized what “forbidden love” potentially looked like for many people in the U.S. and around the world. I’m happy to say that many strides have been made in the 14 years since the movie was released. I have several LGBTQ+ friends, and I consider myself to be an ally. More work has to be done, but I am accepting of all. Love is love.